VANCOUVER, June 21, 2018 /CNW/ - Power Metals Corp. ("Power Metals Corp." or the "Company") (TSX VENTURE:PWM)(FRANKFURT:OAA1)(OTC:PWRMF) is pleased to announce that drilling has commenced in the Main Dyke area, on the Henry Dome on the Case Lake Property, 80 km east of Cochrane. The first drill hole for this 2018 summer drill program will be PWM-18-84 on the Main Dyke (Figure 1). A total of 5,400 m of drilling and 50 holes was previously completed on the Main, North and South Dyke last year with great success. Dr. Selway, VP of Exploration, stated "We are thrilled to commence drilling again at Case Lake for this extremely large drill program. We anticipate drilling in excess of 15,000 metres over several targets that we have identified through previous drilling and our successful mapping programs." 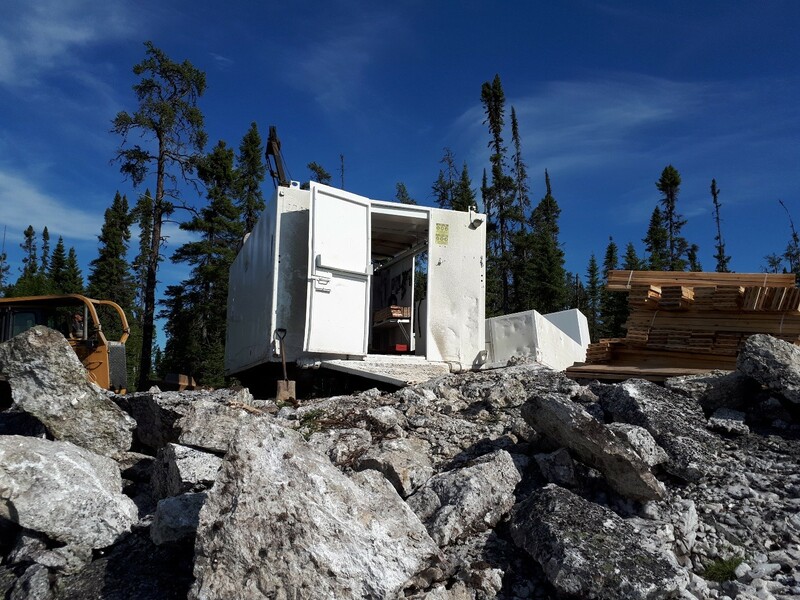 Near the end of the 2017 drill program, Power Metals' exploration team discovered two new spodumene pegmatite dykes located between the Main Dyke and the South Dyke. The first new dyke was intersected in PWM-17-42 and 43 with locally up to 30% spodumene. The exploration team then targeted the new dyke to intersect it again in PWM-17-44 and 49. This new dyke is located 20-40 m down hole from the Main Dyke and 35-40 m vertical depth from the surface. The second new spodumene pegmatite dyke was intersected in PWM-17-42 and 49. It is located 50 m down hole from the Main Dyke and 50-80 m vertical depth from surface. One of the drill targets for the 2018 summer drill program will be to extend the strike length of these two new spodumene pegmatite dykes between the Main and South Dykes. Figure 1 Drill setup on PWM-18-84 on Main Dyke at Case Lake. Case Lake Property is located in Steele and Case townships, 80 km east of Cochrane, NE Ontario close to the Ontario-Quebec border. The Case Lake pegmatite swarm consists of five dykes: North, Main, South, East and Northeast Dykes on the Henry Dome. Power Metals has an 80% interest with its 20% working interest partner MGX Minerals Inc. This press release contains projections and forward-looking information that involve various risks and uncertainties regarding future events. Such forward-looking information can include without limitation statements based on current expectations involving a number of risks and uncertainties and are not guarantees of future performance of Power Metals. There are numerous risks and uncertainties that could cause actual results and Power Metals' plans and objectives to differ materially from those expressed in the forward-looking information, including other factors beyond Power Metals' control. Actual results and future events could differ materially from those anticipated in such information. These and all subsequent written and oral forward-looking information are based on estimates and opinions of management on the dates they are made and are expressly qualified in their entirety by this notice. Except as required by law, Power Metals assumes no obligation to update forward-looking information should circumstances or management's estimates or opinions change.